Fires can start in a home or business with little more than a small spark and destroy an entire property within a matter of minutes. When there is the possibility of such a destructive element occurring within your home, it is essential to understand exactly who to call to begin the fire damage restoration effort. 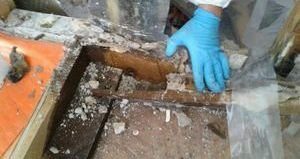 911 Restoration of East Dallas is a full-service, restoration company that provides smoke restoration, odor removal, soot and ash removal, and water damage restoration. All of these services are part of a fire damage restoration plan that technicians will implement to customers in Garland, Mesquite, Allen, and the surrounding cities. Technicians will provide property owners with a free fire damage assessment once they arrive. During this survey, they will take note of all the damage created by both the flames and the fire hoses. When fire and smoke influence your property, you deserve complete fire restoration services, and 911 Restoration of East Dallas is prepared to give that to you. We firmly believe that no fire is too big to recover from and the East Dallas technicians are dedicated to showing you that it is possible to get a Fresh Start. So, give us a call today, and we will implement the fire and smoke restoration services you need. Even though charred wood and burned furnishings are the main issues that come to mind when people think of a property fire, there are also other problems that arise, such as water damage and mold growth. Water damage is a common byproduct of property fires. The fire hoses will spray hundreds of gallons of water inside a home to put out the flames, completely flooding the interior. Some properties have fire sprinklers, which will leave your walls, floors, and possessions soaked, creating extensive water damage and possibly sparking a mold infestation. The type of water that is used to extinguish a fire is known as “gray water.” It is often dirty and contains bacteria that can encourage the growth of mold throughout your property. 911 Restoration of East Dallas employs IICRC certified technicians that care and understand what type of fire damage restoration you need to recover from such a disaster. Call the repair techs today. 911 Restoration of East Dallas is prepared to handle all aspects of the fire damage restoration process for you, including assistance with filing your insurance claim. Our staff members will consult you on your insurance policy for free to help you determine what coverage you are entitled to receive. We provide direct insurance billing, so you never have to worry about sending the information over yourself. We will even help you take inventory of your lost and damaged possessions by creating an itemized list to submit to your insurance company. By submitting this list to your provider you will have the best chances of claiming the most out of your policy. Let 911 Restoration of East Dallas handle all the fire and smoke removal work you need. Our highly trained technicians will give you peace of mind by making your property look better than new after a fire, so give us a call today!